One luxurious boutique hotel that I was very excited to stay at was the J.K. Place Firenze. J.K. Place Firenze is ranked by U.S. News as one of the Best Hotels in Europe for 2019. Before I visited Florence, I had seen this exquisite hotel in many prestigious news coverages, including Travel and Leisure, Elle, Conde Nast Traveller, Architectural Digest, etc. and since I have always wanted to someday visit as a die-hard interior design lover. This small and elegant hotel is tucked away on the corner of Piazza Santa Maria Novella. The Duomo is a five-minute walk away and the chic designer boutiques on Via Tournabuoni are also just a short walk away too. This tall and elegant hotel was originally a town house that was then redesigned by internationally renowned Architect Michele Bonan ( the man behind Ferragmo’s Lungarno hotels). It’s a perfect combination of modern sophistication and old world charm. Instead of a traditional check in area, I was greeted by the friendly hotel stuff at their very exquisite library that has an extensive number of books available to Guests. Claudio Meli, the hotel’s General Manager, in his fine Italian suit jacket paired with a silk handkerchief, welcomed me with his rich knowledge of the very city he was born in. 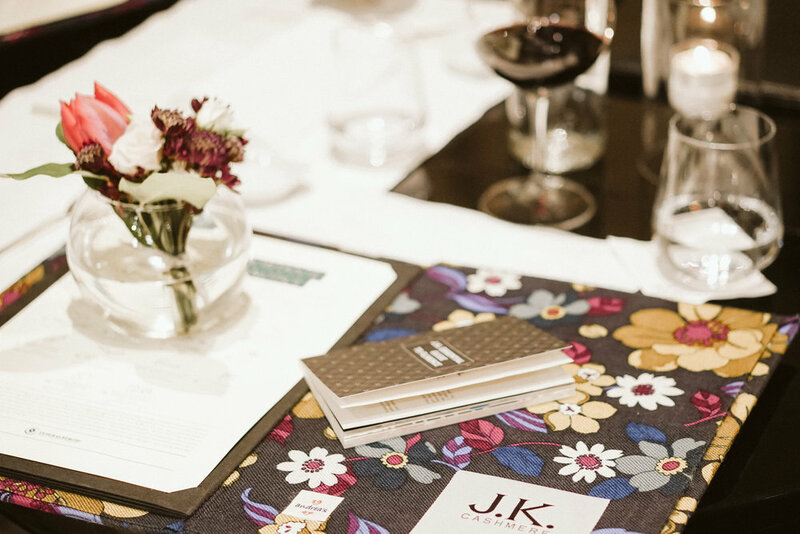 Every guest also receives a complimentary copy of his booklet, the “J.K. Essential Guide to Florence”. The understated luxury townhouse has a total of 20 rooms spread over four floors. All rooms are designed with natural tones, wood floors and fire places. Since its opening in 2003, the strikingly beautiful interior has become a fashionable favorite. Hubby and I stayed at Room NO 12 which overlooks the expansive Piazza. It’s about 500 square feet and includes a cozy living area with a sofa, chairs, a fireplace, as well as a four poster bed fitted with high end Italian linens. The travertine all-marble bathroom is equipped with separate WCs, tubs, and showers. Breakfast is a mix of “American – Tuscan “ buffet style. A vast assortment of home-made breads, cakes, yogurt and fresh fruit were available. You can also order French toast and delicious pancakes with maple syrup. The beautiful china dishes made the finest Italian coffee and tea assortments even more enjoyable. After a full day of exploring the city, we had the most amazing dinner at J.K Lounge. A seductive and intimate atmosphere of the 50’s paired with an overall masculine tone and touches of modern photography works and iconic references to the 70’s filled the lounge, the signature work of Michele Bonan’s. Every dish was so scrumptious. The octopus lover and tiramisu cake were the best I ever had. Sitting in the comfortable white linen upholstered armchair with such exquisite surroundings, I felt like I was apart of a royal family. GM Claudio Meli and his staff provide the ultimate in personalized concierge service. No wonder the hotel has earned a 5 star guest rating on TripAdvisor. A hotel's guest rating is calculated using data provided under license by TripAdvisor. A total of 714 have reviewed the J.K. Place Firenze, giving it a rating of 5, on a scale of 1-5. J.K Place Firenze is not your average luxury hotel. It’s an understated luxurious life style, a once in a life time experience that you definitely need to try for yourself. Thank you to the J.K Place Firenze for making our stay such a memorable and luxurious retreat! The Salon is full of eclectic collection of unique pieces. On the Charles X fireplace the feathered headdress of a chief tribesman, from Zaire. Art Deco pouf in zebra skin and a lamp from the 1950s. The charming Library is served as reception and is full of books that are available to guest. Plaster casts depicting famous writers from the 1800’s are from a well known casts gallery. Above the Regency fire place, a painting from the 80’s hangs. 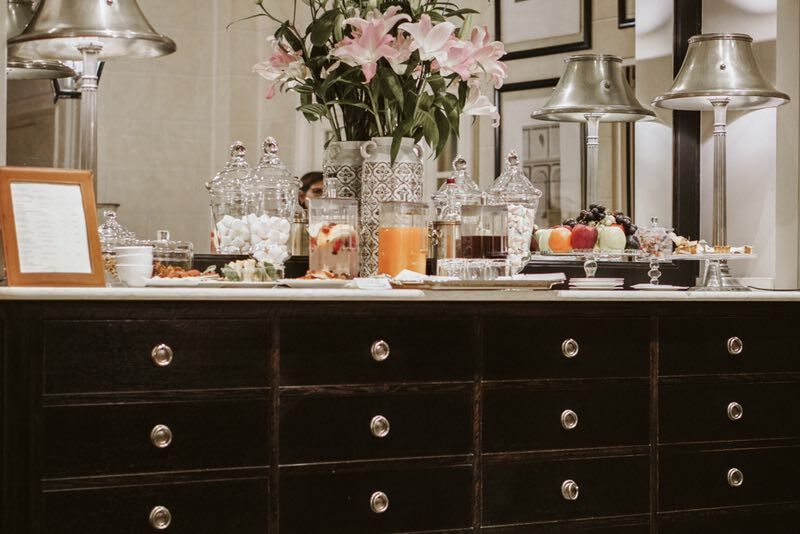 The beautiful sideboard is laid with jars of sweets, fresh fruits, home -made cakes , hot and cold drinks to which guests can help themselves. 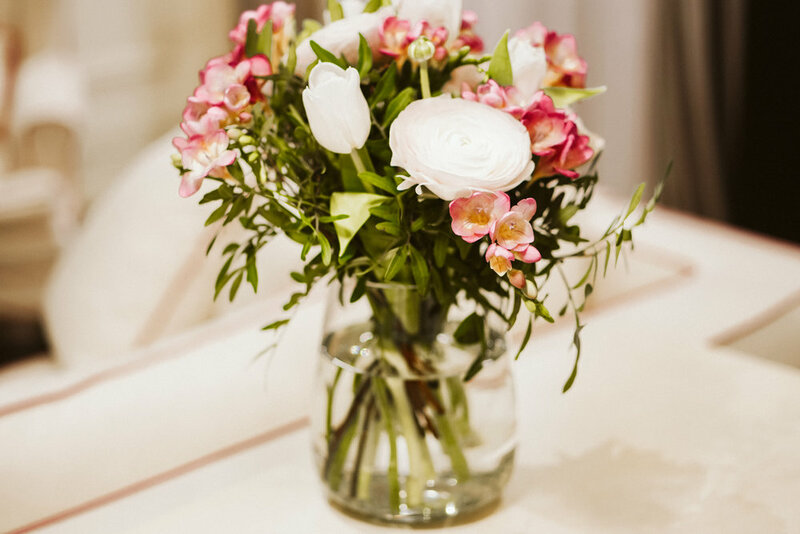 The Cozy little dens has stunning flower arrangement. The rooms are done in a palette of whites and creams with blond oak floors, four posters hung with heavy wool drapes. Grey sand stone is used for the wide, airy stairway in neoclassical taste. The breakfast room is paved with grey sandstone of the original building. A large unique walnut table and Latterns in copper are all from the 1800s. Chinese style chairs are designed by Michele Bonan. The hotel entrance is displayed with stunning antiques, Chinas and paintings. It has the discreet atmosphere of a luxurious private residence. The walls are hung with huge mirrors, drawings and engraving. Indulge yourself on this super comfortable four-poster canopy bed in creamy curtains. Subtle shades of oatmeal add understated elegance. This picture is the courtesy of J.K PlaceI Firenze. Piazza di Santa Maria Novella, J.K.Place occupies a particularly beautiful pedestrian Piazza, Santa Maria Novella.